The sun is out, and the beach is calling your name. Okay, not exactly. But soon it will be. And if shaving is your style, it’s time to get serious about preventing razor burn. No matter how much body hair you choose to remove (if any at all), nobody enjoys those itchy red bumps that appear after the act. Luckily, a solution is already sitting in your kitchen. So whether you have razor burn on your legs, armpits, or bikini area, we have the DIY remedies you’re looking for. Keep scrolling to discover the best recipe to get rid of your razor burn. Why It Works: Apple cider vinegar comprises anti-inflammatory properties that work to lessen inflammation on the skin, as well as ease any itchiness. Black tea bags are also great for razor burns as they contain tannic acid, which reduces inflammation and redness. How to Make It: Take 1/2 cup of apple cider vinegar with a small amount of water, and dab a cotton ball in the solution. Apply the vinegar to the affected area, and let dry naturally. While the vinegar is drying on the skin, dip a black tea bag into hot water for a few minutes. Remove the tea bag from the hot water and place it in the refrigerator for 10 minutes. After 10 minutes, take the cool tea bag out and massage it into the affected area for three minutes. Repeat several times a day for quick relief. Why It Works: Coconut oil is a great skin softener and helps do away with dry and hard skin conditions. By combining coconut oil with exfoliating substances, such as sugar, you can successfully scrape off excess dead skin cells without irritating your skin. How to Make It: Mix four tablespoons of coconut oil with one tablespoon of honey, two tablespoons of brown sugar, and two tablespoons of white sugar. Apply the scrub to the affected area and let sit for 10 minutes. Wash the scrub off with warm water. Why It Works: Tea tree oil contains antiseptic, anti-inflammatory, and antibacterial properties, while olive oil has anti-inflammatory assets that help make the skin smooth. How to Make It: Mix one tablespoon of olive oil with five drops of tea-tree oil. Using a cotton ball, apply the mixture to the affected area. Let sit for 15 minutes and wash off with warm water. Why It Works: Oatmeal contains anti-inflammatory properties and soothing properties that help to lessen irritation and inflammation that are caused by razor bumps. How to Make It: Mix equal portions of ground oatmeal and plain yogurt in a bowl. Next, add one teaspoon of honey to the mixture. Apply the paste to the affected area and let dry for about 30 minutes. Wash the paste off with warm water. Repeat twice a day for three days. Why It Works: Cucumbers contain anti-inflammatory and hydrating properties that help to nourish the skin. They are also high in both vitamin K and vitamin C, two vitamins that are best known for their healing properties. How to Make It: Peel one cucumber, add it to 1/4 cup of milk, and mix in a blender. Place the puree in the refrigerator for 10 minutes and then apply to the affected area. Let sit for 10 minutes and then wash the area with warm water. Why It Works: Strawberries have anti-inflammatory properties that can help treat razor bumps. How to Make It: Mash a few strawberries with a small amount of sour cream, and mix properly. Apply the paste to the affected area and let sit for 15 to 20 minutes. Wash the paste off with cold water, and pat dry. 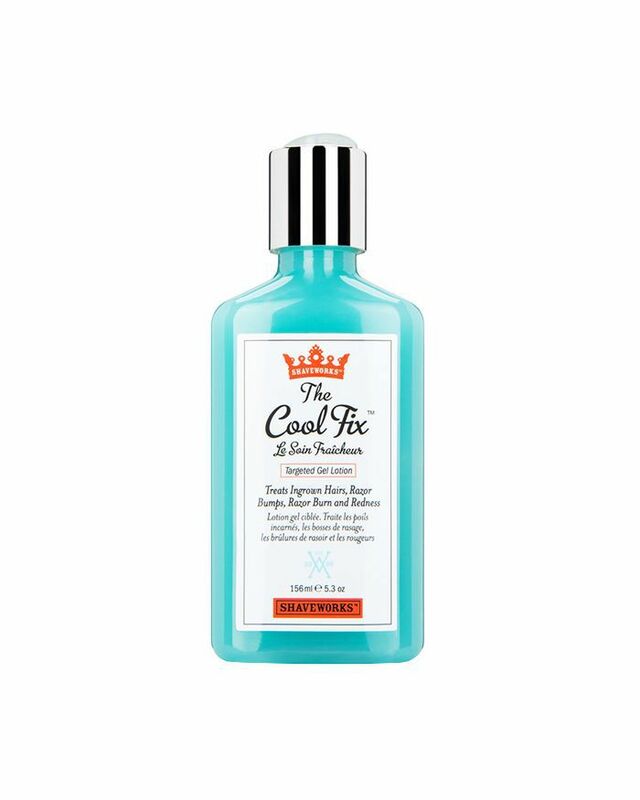 Try this soothing blue gel to target ingrown hairs, razor bumps, razor burn, and redness. The formula combines exfoliating agents to help release trapped hairs and kill bacteria while offering soothing relief for irritated patches.